The 7th edition of the MTN Business App of the Year Awards took place on Thursday, 11 October 2018 at the Sandton Convention Centre, Johannesburg South Africa. The prestigious award was attended by dignitaries from the public and private sector, members of the app development community, and other related stakeholders. The MTN Business App of the Year Awards sees both small businesses and large corporates converging, and working together for the greater good of society. It also aims to see solutions being developed and presented by people from a diverse range of socio-economic backgrounds, thereby connecting people who can provide real solutions to the real-life challenges across society. This year’s edition focused on expanding the judging panel to nine members. The panel was made up of business leaders and experts. All were well equipped to provide inspiration and guidance to the entrants, with the ultimate aim being to enable them to enter, participate and succeed in the world of business. 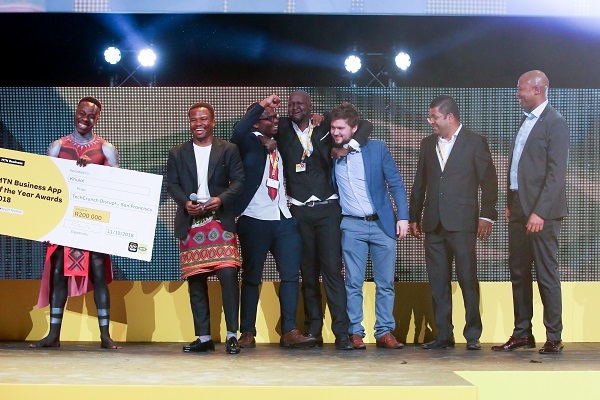 Khula ecosystem was named as the overall winner of this year’s MTN Business App of the Year Awards. Khula Ecosystem is an app that breaks the barriers which have kept thousands of black South African farmers out of the agricultural industry. Khula is not just an app, it’s an ecosystem which links everyone from the farmer to the logistics, to the warehouse and to the client. “Winning this award is game-changing. It’s an honour to know that our hard work is recognised,” says Khula co-founder and director, Karidas Tshintsholo. “With this app we wanted to do something meaningful within the African agricultural space. The best way to transform the African economy is to find solutions for Agriculture and the app does exactly that. We’re hoping to engage with the department of development and agricultural on a value basis. There’s is a wide range of opportunities that we would like to engage in and the best place is in Africa, because it’s a purely African solution that speaks to our problems and needs,” he added. In addition to winning the overall prize, the Khula app also won in the Best Agriculture Solution category. Wanda Matandela, MTN Business chief enterprise officer says the mobile app industry is one of the fastest growing industries globally, with millions of apps out there transforming how people live, work and play. “MTN has a focus on innovation and we adhere to empowering start-ups and developers within the community. There are many game-changing solutions to South African problems that come out of these development hubs and we want to be part of that innovation. We’ve evolved over the years to include a number of categories, we’ve added categories that have an impact in solving South African problems,” concluded Llewellyn Ramasgar, MTN’s GM for Enterprise Marketing.